Wolves, including red wolves (Canis rufus) and grey wolves (Canis lupus), rely on various different dietary tactics to ensure the health of the pack. The daily averages of meat consumption are based on what a wolf eats at any given time and the long periods a wolf may go without eating. The term "feast or famine diet" refers to wolves and many other large predators. Prey isn't always abundant for these large canines, so they've developed a metabolism that helps them store fat and energy for long periods while prey is scarce. In one sitting, an adult wolf can effectively eat 22 1/2 pounds of meat, although this is the extreme and not the daily average. That would be a great feast, but an adult can go 12 days -- sometimes more -- without food, making up the "famine" part of their diet. 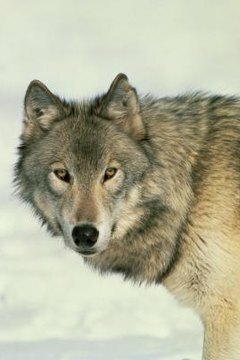 According to Western Wildlife Outreach, an adult grey wolf eats an average of 5 to 14 pounds of meat each day. This is only an average due to their feast-or-famine diet. For an adult wolf to survive, it needs a minimum daily average of about 2 1/2 pounds of meat per day; to breed successfully, however, they need an average of about 7 pounds of meat per day on average. Red wolves, being slightly smaller than their grey wolf cousins, typically eat an average of 2 to 5 pounds of meat per day. Because of their feast-or-famine lifestyle, wolves are known to hoard large prey to feast on at later times when food may be more scarce. Although they can and will eat more than 20 pounds in a setting, storing food helps the members of the pack get enough nutrients and energy to effectively maintain their lifestyle. After a large meal, the wolves may spend up to a day resting and digesting their meal. The majority of a grey wolf's diet comes from large hoofed animals such as various species of deer including elk, moose and caribou. These large animals aren't their only sources of food, however, as wolves are sometimes forced to hunt smaller game in order to survive. Rabbits, beavers and other small mammals make up other parts of their diet when larger prey is harder to come by and are staples for the smaller red wolf. On occasion, birds and rodents may supplement the wolves' diets.